A budding startup will sell you a few liters of young people’s blood as a supposed anti-aging treatment. It’s grotesque — but only slightly more so than the rest of the American for-profit medical system. For eight grand via PayPal, a startup called Ambrosia will infuse aspiring death-thwarters over thirty-five with a liter of sprightly young blood (or two liters for the low, low price of $12,000). According to its founder, Jesse Karmazin, the anti-aging remedy — which, because it’s a blood transfusion, is legal as an “off-brand” treatment already approved by the Food and Drug Administration — will bless those who receive it with improved focus, memory, muscle tone, and appearance. 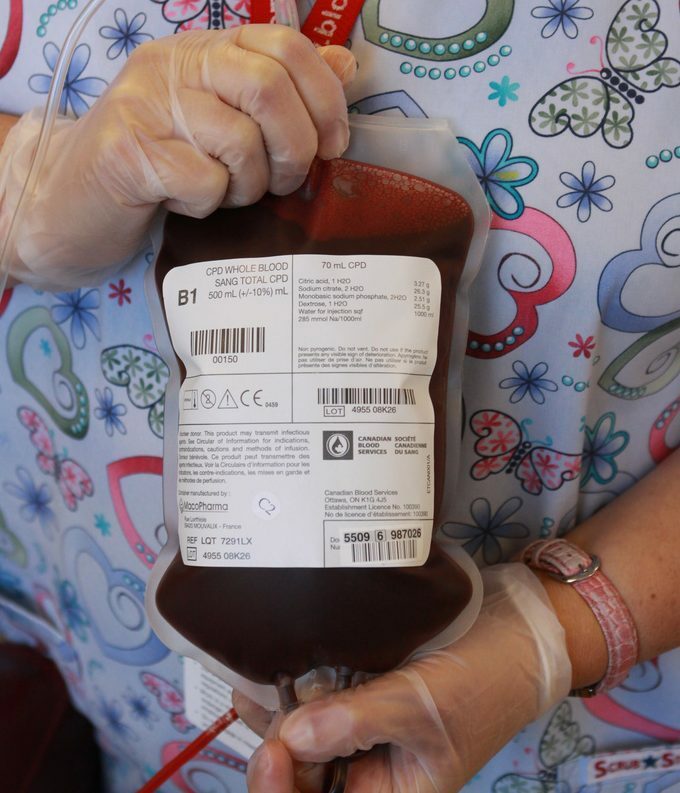 Ambrosia is reportedly operating in five US cities, where clinics purchase young blood from blood banks and shoot it into their clients. The company claims to boast a waiting list of would-be participants eager for the rejuvenating injections (unruffled, apparently, by the lack of peer-reviewed studies to back Karmazin’s lofty claims or the fact that he isn’t a medical practitioner). If the idea of ultra-rich people harvesting youthful plasma in their quest for longevity seems dystopian, it is. But it’s not as sharp a departure into sci-fi territory as it may seem. Ambrosia’s unsettling business model is entirely consistent with how health inequalities already work in America: in a country where the rich outlive the poor by some fourteen years, a gap that has doubled since 1980 — money literally buys longer lifespans. When basic needs like housing and healthcare are commodified, it’s no stretch to say that poor people’s lives are being “harvested” to enrich those who profit off the industries that sell them. Ambrosia nudges the status quo only slightly forward, laying bare the grotesque dynamic of American society in which mass pain at the bottom is accepted in exchange for unencumbered wish fulfillment at the top. In Ambrosia’s case, this dynamic is quite literal: at the same time the company runs up a wait list of clients ready to pay thousands for a jolt of fresh blood, the plasma donation industry is booming. Between 2006 and 2016, the size of the industry more than tripled, with around 80 percent operating in poor neighborhoods. One piece in the Atlantic detailed the plight of so-called “plassers,” who sell plasma multiple times a week and commonly suffer uncomfortable side effects. One of the drivers of the plasma boom are pharmaceutical companies, which use vast amounts of plasma to manufacture certain drugs and have tended to source it by paying donors around $50 per draw. It goes without saying that these often life-saving drugs are rarely affordable or accessible to the people who sold their plasma to make them. And plassers certainly couldn’t afford to inject their own blood back into their veins in an Ambrosia clinic. The poor aren’t just harvested for their plasma: organ donations are disproportionately likely to go to richer patients, because their ability to travel allows them to place themselves on multiple geographical waiting lists and they can better access the post-operative treatment needed to ensure a healthy transplant. There’s also reason to believe that, given the rise in organ donations owing to the opioid crisis, a growing share of available organs are coming from disproportionately poor donors who are more likely to be drug-dependent. In the US, good health is shifted from the poor to the rich in countless other, less obvious ways, all of which conspire to produce that fourteen-year gulf in life expectancy. Our healthcare and insurance systems remain heavily privatized because owners of capital have a financial interest in maintaining it, delivering state-of-the-art care to the wealthy while shutting out the poor and the poorly insured. The express purpose of copays is to defray healthcare costs by decreasing utilization, erecting a barrier of entry that those without means are unable to surmount. Perversely, the rich also benefit from the social degradation that takes a toll on health: extreme inequality and a weak welfare state make the US a splendid place to accumulate wealth, even as it imposes stress, precarity, inadequate housing, and community upheaval on the poor — each of which contribute to mortality rates unseen in peer countries. Since 2000, the richest Americans have gained five years of average life expectancy; the lifespan of the poorest has stagnated or fallen. So if Ambrosia’s medically dubious service of pumping rich veins full of young, poor blood seems shocking, it’s important to see the treatment as the nightmarish offspring of a monstrous health system. The wellbeing of poor people has already been commodified into a profit center for monied interests. Combating that will require robust universal programs like Medicare for All, social housing, child and elder care, and investments in communities: not only to redistribute material resources, but to restore the years of life that for too long have been stolen from those at the bottom rungs of society. The ability to live a dignified life is good for our health — no matter how old our blood is.